Silver Stars bracelet handmade in .925 sterling silver. A hard to find non production jewelry piece. 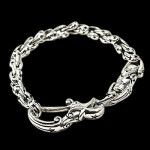 This is a more delicate piece, yet unisex, and suitable for stacking with multiple bracelets.